Veteran deathfolk, blues, psych-fi, traditional and world twangist & singer IAN A. ANDERSON has returned to solo gigs, mixing a huge variety of songs from his 50+ year career with fascinating anecdotery. First inspired by ancient folk blues records, Ian A Anderson (no, not that one!) was caught up in the late 1960s blues boom, mentored by Alexis Korner and supported by radio DJs like John Peel. Following a series of indie-label EPs, his first proper album Stereo Death Breakdown came out on Liberty/UA in 1969 to coincide with a national tour on which Ian Anderson’s Country Blues Band supported US blues legend Mississippi Fred McDowell. But then, performing regularly in key venues of the day like London’s celebrated Les Cousins and the Bristol Troubadour, he took a sideways swerve into what now gets called ‘psych folk’. He released 4 solo albums of original songs and tunes, 3 of them on Bristol’s legendary Village Thing label, and appeared at the very first Glastonbury festival. By the mid-’70s he’d returned to folk, blues & roots material, but with his own English accent. His duo Hot Vultures with Maggie Holland (3 albums) toured extensively internationally as well as on the UK college circuit and at early folk festivals such as Cambridge. People from the emerging punk scene like a pre-Clash Joe Strummer could be found alongside folk fans in their audiences. They were among the few ’70s UK folk artists to have an LP released in the USA. Entering the 1980s, he teamed up with some notable English traditional folk musicians in The English Country Blues Band (2 albums), noisy dance band Tiger Moth (2 albums) and its world music influenced big-band recording offshoot Orchestre Super Moth. Then, for most of the ’90s, he took a long break from live performances while he concentrated on broadcasting, producing records by world music artists, and other music-related activities. Everything changed again in the 21st century. From 2004-2006, Tiger Moth re-formed for festivals like WOMAD, Sidmouth and The Big Chill. Then, following a command performance for folk legend Shirley Collins – who had helped uncover the fact that Ian’s great grandmother had been a source for songs collected by Ralph Vaughan Williams in 1904! – Blue Blokes 3, an impromptu trio with PiL’s Lu Edmonds and 3 Mustaphas 3’s Ben Mandelson, were invited to make an album and tour nationally. After this he and Mandelson continued recording and live dates as the duo The False Beards, and in 2016 Hot Vultures re-united for a successful summer tour, shining at folk festivals including Sidmouth, Priddy and Shrewsbury. 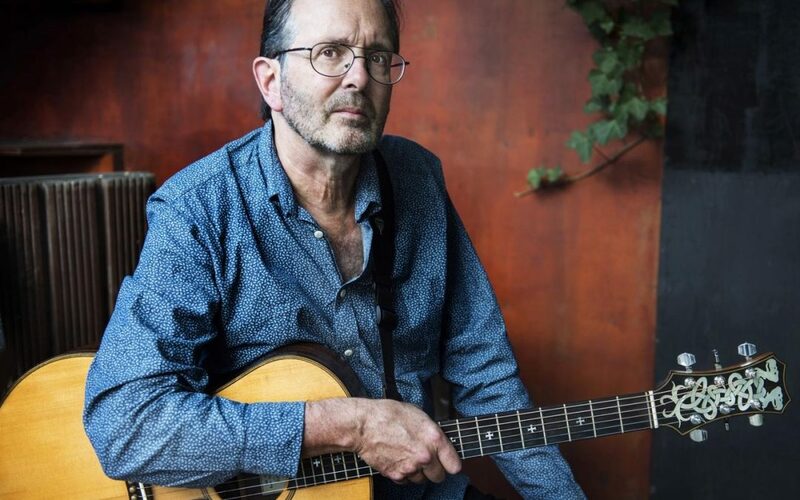 Re-enthused, in 2017 Ian decided to try a few solo gigs again for the first time in 45 years, “to scare myself.” They actually turned out rather well, so he’s continued, including returning to first principles with the entirely solo acoustic release Deathfolk Blues Revisited. 2019’s Onwards!, the first ever compilation to range across his entire musical career, highlights his startlingly varied recorded output, which will probably surprise both newcomers and those who only know a part of it. Jason Steel cut his teeth playing & singing in the ‘Psych-Folk’ collective The Owl Service. His solo work is a different beast, however; a mongrel hybrid of twisted pre-war blues, austere British folk and inebriated, sentimental song in all its forms. Steel has released three albums & numerous EPs, appeared on the Rough Trade label and recorded three BBC sessions. He has completed several national tours, sharing stages with Meg Baird & Michael Chapman.